حمیدی, حجت الله, خطیبی, علی. (1398). بررسی معماری و چالش های رایانش ابری خودرویی. فصلنامه علمی - پژوهشی مهندسی حمل و نقل, 10(3), 543-566. حجت الله حمیدی; علی خطیبی. "بررسی معماری و چالش های رایانش ابری خودرویی". فصلنامه علمی - پژوهشی مهندسی حمل و نقل, 10, 3, 1398, 543-566. حمیدی, حجت الله, خطیبی, علی. (1398). 'بررسی معماری و چالش های رایانش ابری خودرویی', فصلنامه علمی - پژوهشی مهندسی حمل و نقل, 10(3), pp. 543-566. حمیدی, حجت الله, خطیبی, علی. بررسی معماری و چالش های رایانش ابری خودرویی. فصلنامه علمی - پژوهشی مهندسی حمل و نقل, 1398; 10(3): 543-566. رایانش ابری خودرویی یک راه حل امیدوار کننده برای بهره برداری از منابع کم استفاده خودروها از جمله قدرت پردازشی، فضای ذخیره سازی، اتصال اینترنت و غیره است. این منابع می‌­تواند میان خودروها به اشتراک گذاشته شود یا توسط مالکین اجاره داد شود تا برای مصارف مختلفی مثل رفع نیاز سخت افزاری سرویس‌ها و اپلیکیشن‌های شبکه خودرویی مورد استفاده قرار گیرند. در واقع می‌‌توان از این طریق به نیاز رو به افزایش برای منابع در شبکه خودرویی پاسخ داد، اگرچه به نظر می‌­رسد این طرح امکان پذیر است اما پیاده سازی آن با مشکلاتی مواجه است. محققان زیادی بر روی طراحی معماری تمرکز کرده­اند تا بر مشکلات مختلف غلبه کنند و در نتیجه نیاز کاربران را با ارائه سرویس قابل اعتماد برآورده کنند. در این مقاله به بررسی طرح ابر خودرویی پرداخته شده و روی ویژگی‌ها و معماری آن تمرکز خواهد شد. 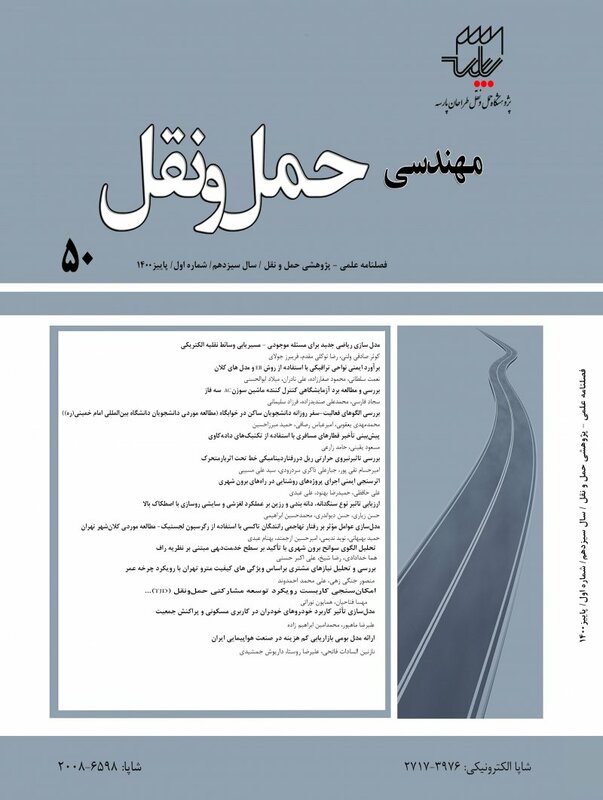 در ابتدا به طور اجمالی انگیزه ایجاد ابر خودرویی مطرح و در ادامه چالش‌های مربوط به طراحی کاوش خواهد شد. علاوه بر این، ویژگی‌های معماری‌های موجود مشخص و یک طبقه بندی از ابر خودرویی ارائه خواهد شد، سپس شاخص‌های دسته بندی معماری­ها معرفی می‌‌شود. -Abdel Hamid, S., Hassanein, H. S. and Takahara, G., (2015) “Vehicle as a resource (VAAR)”, In IEEE Network, Vol. 29, No. 1, pp. 12–17. -Abuelela, M., and Olariu, S. (2010) “Taking vanet to the clouds”, In Proceedings of the 8th International Conference on Advances in Mobile Computing and Multimedia, MoMM, pp. 6–13, New York, NY, USA. -Aloqaily, M., Kantarci, B. and Mouftah, H. T. (2014) “Provisioning delay effect of partaking a trusted third party in a vehicular cloud”, In Global Information Infrastructure and Networking Symposium (GIIS), IEEE, 2014, pp. 1–3. -Al-Sultan, S., Al-Doori, M. M., Al-Bayatti, A. H., and Zedan., H. (2014) “A comprehensive survey on vehicular ad hoc network” In J. Network Computer Application., Vol. 37, pp. 380–392. -Arif, S., Olariu, S., Wang, J., Yan, G., Yang, W., and Khalil, I. (2012) “Datacenter at the airport: Reasoning about time-dependent parking lot occupancy”, In Parallel and Distributed Systems, IEEE Transactions on, Vol. 23, No. 11, pp. 2067–2080. -Arkian, H. R., Atani, R. E., Diyanat, A. and Pourkhalili, A. (2015) “A cluster-based vehicular cloud architecture with learning-based resource management”, in The Journal of Supercomputing. -Baby, D., Sabareesh, R. D., Saravanaguru, R. and Thangavelu, A. (2013) “VCR: vehicular cloud for road side scenarios”, In Advances in Computing and Information Technology, Springer, pp. 541–552. -Bitam, S., Mellouk, A. and Zeadally, S. (2015) “Vanet-cloud: a generic cloud computing model for vehicular ad hoc networks”, in Wireless Communications, IEEE, Vol. 22, No. 1, pp.96–102. -Bitam, S. and Mellouk, A. (2012) “Its-cloud: Cloud computing for intelligent transportation system”, In Global Communications Conference (GLOBECOM), 2012 IEEE, pp 2054–2059. -Bravo-Torres, J. F., Ordonez-Morales, E. F., Lopez-Nores, M., Blanco- Fernandez, Y. and Pazos-Arias, J. J. (2014) “Virtualization in vanets to support the vehicular cloud—experiments with the network as a service model”, In Future Generation Communication Technology (FGCT), 2014 Third International Conference, pp. 1–6. IEEE. -Campolo C. and Molinaro, A. (2013) “Multichannel communications in vehicular ad hoc networks: a surve”, in Communications Magazine, IEEE, Vol. 51, No. 5, pp. 158–169. -Chaqfeh, M., Lakas, A. and Jawhar, I. (2014) “A survey on data dissemination in vehicular ad hoc networks”, in Vehicular Communications, Vol. 1, No. 4, pp. 214–225. -Chen, W., Guha, R. K., Kwon, T. J., Lee, J. and Hsu, Y.-Y. (2011) “A survey and challenges in routing and data dissemination in vehicular ad hoc networks”, in Wireless Communications and Mobile Computing, Vol. 11, No. 7, pp.787–795. -Cheriton, D. R. and Gritter, M. (2000) “Triad: A new next-generation internet architecture”, http://www.dsg.stanford.edu/triad/. -Cordeschi, N., Amendola, D., Shojafar, M. and Baccarelli, E. (2015) “Distributed and adaptive resource management in cloud-assisted cognitive radio vehicular networks with hard reliability guarantees”, in Vehicular Communications, Vol. 2, No. 1, pp. 1–12. -Dinh, H.T., Lee, C., Niyato, D. and Wang P. (2011) “A survey of mobile cloud computing: architecture, applications, and approaches”, Proceedings of the wireless communications and mobile computing, Vol. 13, No. 18, pp. 1587–1611. -Eltoweissy, M., Olariu, S. and Younis, M. (2010) “Towards autonomous vehicular clouds”, In Ad hoc networks, pp. 1–16. Springer. -Fernando, N., Loke, S. W. and Rahayu, W. (2013) “Mobile cloud computing”, Future Gener. Comput. Syst., Vol. 29, No. 1, pp.84–106. -Gillani, S. A., Shah, P. A., Qayyum, A. and Hasbullah, H. B. (2015) “Mac layer challenges and proposed protocols for vehicular ad-hoc networks”, In Vehicular Ad-hoc Networks for Smart Cities, pp. 3–13. Springer. -Gkatzikis L. and Koutsopoulos, I. (2013) “Migrate or not? Exploiting dynamic task migration in mobile cloud computing systems”, Wireless Communications, IEEE, Vol. 20, No. 3, pp. 24–32. -Gu, L., Zeng, D. and Guo, S. (2013) “Vehicular cloud computing: A survey”, In Globecom Workshops, 2013 IEEE, pp. 403–407. -Haddadou, N., Rachedi, A. and Ghamri, Y. (2011) “Modeling and performance evaluation of advanced diffusion with classified data in vehicular sensor networks”, in Wireless Communications and Mobile Computing, Vol. 11, No. 12, pp. 1689–1701. -Harri J. and Kenney, J. (2015) “Multi-channel operations, coexistence and spectrum sharing for vehicular communications”, In Vehicular Ad hoc Networks, pp. 193–218. Springer. -Harri, J., Filali, F. and Bonnet, C. (2009) “Mobility models for vehicular ad hoc networks: a survey and taxonomy”, in Communications Surveys & Tutorials, IEEE, Vol. 11, No. 4, pp. 19–41. -Hashemi, H. T. and Khorsandi, S. (2012) “Load balanced vanet routing in city environments”, In Vehicular Technology Conference (VTC Spring), 2012 IEEE 75th, pp. 1–6. -Hayes, B. (2008) “Cloud computing”. Commun. ACM, Vol. 51, pp. 9–11. -He, W., Yan, G. and Da, Xu. L. (2014) “Developing vehicular data cloud services in the IOT environment”, in Industrial Informatics, IEEE Transactions on, Vol. 10, No. 2, pp. 1587–1595. -Hu, X., Wang, L., Sheng, Z., TalebiFard, P., Zhou, L., Liu, J. and Leung, V. (2014) “Towards a service centric contextualized vehicular cloud”, In Proceedings of the 4th. ACM International Symposium on Development and Analysis of Intelligent Vehicular Networks and Applications, pp. 73–80. -Hussain, R. and Oh, H. (2014) “Cooperation-aware vanet clouds: Providing secure cloud services to vehicular ad hoc networks”, in JIPS, Vol. 10, No. 1, pp. 103–118. -Hussain, R., Son, J., Eun, H., Kim, S. and Oh., H. (2012) “Rethinking vehicular communications: Merging vanet with cloud computing”, In Cloud Computing Technology and Science (CloudCom), IEEE 4th International Conference, pp. 606–609. -Jabbarpour, M. R., Jalooli, A., Marefat, A. and Noor, R. (2015) “A taxonomybased comparison of vehicle cloud architectures”, In Information and Computer Networks (ICICN’15), 2015 3rd. International Conference. -Kang, W. M., Lee, J. D., Jeong, Y.-S. and Park, H. (2015) “VCC-SSF: service oriented security framework for vehicular cloud computing”, Sustainability, Vol. 7, No. 2, pp. 2028–2044. -Karagiannis, G., Altintas, O., Ekici, E., Heijenk, G., Jarupan, B., Lin, K. and Weil, T. (2011) “Vehicular networking: A survey and tutorial on requirements, architectures, challenges, standards and solutions”, In IEEE Communications Surveys and Tutorials, Vol. 13, No. 4, pp. 584–616. -Kim, R., Lim, H. and Krishnamachari, B. (2016) “Prefetching-based data dissemination in vehicular cloud systems”, in IEEE Transactions on Vehicular Technology, Vol. 65, No. 1, pp. 292–306. -Kumar, N., Iqbal, R., Misra, S. and Rodrigues, J. (2015) “Bayesian coalition game for contention-aware reliable data forwarding in vehicular mobile cloud”, in Future Generation Computer Systems, Vol. 48, pp. 60–72. -Kumar, N., Zeadally, S., Chilamkurti, N. and Vinel, A. (2015) “Performance analysis of Bayesian coalition game-based energy-aware virtual machine migration in vehicular mobile cloud” in Network, IEEE, Vol. 29, No. 2, pp. 62–69. -Kumar, S., Gollakota, S. and Katabi, D. (2012) “A cloud-assisted design for autonomous driving”, In Proceedings of the first edition of the MCC workshop on Mobile cloud computing, ACM, pp. 41–46. -Lee, E., Lee, E.-K., Gerla, M. and Oh., S. Y. (2014) “Vehicular cloud networking: architecture and design principles”, Communications Magazine, IEEE, Vol. 52, No. 1, pp. 148–155. -Liu, B., Jia, D., Wang, J., Lu, K. and Wu, L. (2015) “Cloud-assisted safety message dissemination in vanet-cellular heterogeneous wireless network”, IEEE Systems Journal, pp.1–12. -Mazloom, S., Mohadesipour, M. and Babaei, H. (2015) “An ontology-based approach for optimal resource allocation in vehicular cloud computing”, in International Journal of Computer Science and Mobile Computing, pp 176–187. -Mekki, T., Jabri, I., Rachedi, A. and Jemaa, M. (2016) “Vehicular cloud networks: Challenges, architectures, and future directions”, In Journal of Vehicular Communications Vol. 9, pp. 268-280. -Mell, P. and Grance, T. (2011) “The NIST definition of cloud computing”, Maryland, US: The National Institute of Standards and Technology. -Mershad, K. and Artail, H. (2013) “Crown: Discovering and consuming services in vehicular clouds”, In Communications and Information Technology (ICCIT), 2013 Third International Conference, pp. 98–102. IEEE. -Mitola, J., Gerald, Q. and Maguire, J. (1999) “Cognitive radio: making software radios more personal” Personal Communications, IEEE, Vol. 6, No. 4, pp. 13–18. -Qin, Y., Huang, D. and Zhang, X. (2012) “Vehicloud: Cloud computing facilitating routing in vehicular networks”, In Trust, Security and Privacy in Computing and Communications (TrustCom), 2012 IEEE 11th International Conference on, pp. 1438–1445. -Rappaport, T. S., Sun, S., Mayzus, R., Zhao, H., Azar, Y., Wang, K., Wong, G. N., Schulz, J. K., Samimi, M. and Gutierrez, F. (2013) “Millimeter wave mobile communications for 5g cellular: It will work!” Access, IEEE, Vol. 1, pp. 335–349. -Refaat, T. K., Kantarci, B. and Mouftah, H. T. (2014) “Dynamic virtual machine migration in a vehicular cloud”, In Computers and Communication (ISCC), 2014 IEEE Symposium on, pp. 1–6. -Salahuddin, M. A., Al-Fuqaha, A. and Guizani. M. (2015) “Software-defined networking for rsu clouds in support of the internet of vehicles”, in Internet of Things Journal, IEEE, Vol. 2, No. 2, pp. 133–144. -Sharma, P., Garg, M. L. and Kaul, A. (2013) “A comprehensive study of requirements for network applications and routing protocols providing resources in vehicular ad hoc networks”, In Advances in Engineering and Technology (AET-ACS’13), 2013 4th International Conference on, pp. 403–411. -Talebifard, P. and Leung, V. (2013) “Towards a content-centric approach to crowd-sensing in vehicular clouds”, in Journal of Systems Architecture, Vol. 59, No. 10, pp. 976–984. -Toutouh, J., Nesmachnow, S. and Alba, E. (2013) “Fast energy-aware olsr routing in vanets by means of a parallel evolutionary algorithm”, in Cluster computing, Vol. 16, No. 3, pp. 435–450. -Wan, J., Zhang, D., Sun, Y., Lin, K., Zou, C. and Cai, H. (2014) “Vcmia: a novel architecture for integrating vehicular cyber-physical systems and mobile cloud computing”, in Mobile Networks and Applications, Vol. 19, No. 2, pp. 153–160. -Wan, J., Zhang, D., Zhao, S., Yang, L. and Lloret, J. (2014) “Context-aware vehicular cyber-physical systems with cloud support: architecture, challenges, and solutions”, in Communications Magazine, IEEE, Vol. 52, No.8, pp. 106–113. -Wang, J., Cho, J., Lee, S. and Ma, T. (2011) “Real time services for future cloud computing enabled vehicle networks”, In Wireless Communications and Signal Processing (WCSP), 2011 International Conference, pp. 1–5. IEEE. -Wang. X. (2015) “Ipv6-based vehicular cloud networking”, in Communications Letters, IEEE, Vol. 19, No. 6, pp.933–936. -Whaiduzzaman, Md., Sookhak, M., Gani, A. and Buyya, R. (2014) “A survey on vehicular cloud computing”, In Journal of Network and Computer Applications Vol. 40. -Wu, D., Luo, J., Li, R. and Regan, A. (2011) “Geographic load balancing routing in hybrid -vehicular ad hoc networks”, In Intelligent Transportation Systems (ITSC), 2011 14th International IEEE Conference on, pp. 2057–2062. -Xu, K., Wang, K.-C., Amin, R., Martin, J. and Izard, R. (2015) “A fast cloud-based network selection scheme using coalition formation games in vehicular networks”, in Vehicular Technology, IEEE Transactions, Vol. 64, No. 11, pp. 5327–5339. -Yang, Q., Zhu, B. and Wu, S., (2016) “An architecture of cloud assisted information dissemination in vehicular networks”, In IEEE Access, Vol. 4, pp. 2764-2770. -Yu, R., Zhang, Y., Gjessing, S., Xia, W. and Yang, K., (2013) “Toward cloud-based vehicular networks with efficient resource management”, in Network, IEEE, Vol. 27, No. 5, pp. 48–55. -Yu, R., Zhang, Y., Wu, H., Chatzimisios, P. and Xie, S. (2013) “Virtual machine live migration for pervasive services in cloud-assisted vehicular networks”, In Communications and Networking in China (CHINACOM), 2013 8th International ICST Conference on, pp. 540–545, IEEE. -Yu, Y.-T., Gerla, M. and Sanadidi, M. Y. (2015) “Scalable vanet content routing using hierarchical bloom filters”, Wireless Communications and Mobile Computing, Vol. 15, No. 6, pp. 1001–1014. -Yu, Y.-T., Li, Y., Ma, X., Shang, W., Sanadidi, M. Y. and Gerla, M. (2013) “Scalable opportunistic vanet content routing with encounter information”, In Network Protocols (ICNP), 2013 21st IEEE International Conference, pp. 1–6. -Yu, Y.-T., Punihaole, T., Gerla, M. and Sanadidi, M. Y. (2012) “Content routing in the vehicle cloud”, In Military Communications Conference (MILCOM), pp. 1–6. IEEE.